This week we will be checking out a prehistoric beast with an even beastlier name! Let's look at Gorgonops! Gorgonops was a creature that lived in what is now Southern Africa during the late Permian era, between 260 and 254 million years ago. It was a synapsid, which means it belonged to the same group as mammals, yet it also shared characteristics with animals we consider reptiles. Because of this, Gorgonops and its close relatives are also informally referred to as "mammal-like reptiles". The much more famous, Dimetrodon, is an earlier example of a synapsid that is also a "mammal-like reptile"s. The largest Gorgonops measured about six feet long from snout to tail and would have eaten meat when alive. Within the genus, there are a few species of Gorgonops recognized by science. Gorgonops torvus was the first to be discovered and is probably the most well-understood because multiple specimens of it have been found. Gorgonops whaitsi was larger than G. torvus and had a more robust snout. Gorgonops whaitsi life reconstruction by Christopher DiPiazza. 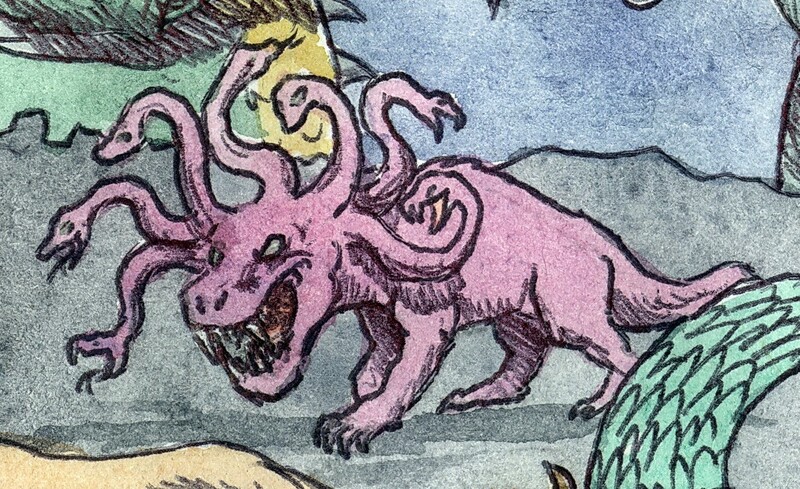 Gorgonops' genus name translates to "gorgon face" in reference to the gorgon, a monster from Greek mythology that resembled a woman with snakes for hair. According to the legend, looking directly at a gorgon's face would turn a person to stone. (Medusa was the most famous gorgon.) In contrast to this, Gorgonops possessed extremely long, sharp teeth in the front of it's mouth, which gave its skull a particularly menacing look. Because of this, it was named in honor of the mythical creature. It is unlikely that looking at an actual Gorgonops would turn anyone to stone, however, and snakes wouldn't evolve for tens of millions of years after Gorgonops' time. The first Gorgonops was discovered and named during the 1800s by a man named Richard Owen. (Somewhat Unrelated Fun Fact: Mr. Owen also coined the term "dinosaur") Since then, several other kinds of related animals from the same family have been unearthed. Since Gorgonops was the first, the name of this family is known as gorgonopsidae. Gorgonops is most well-known for its teeth, which, like I said earlier, were proportionally long, sharp, and curved. They were similar in appearance to the canines on some carnivorous mammals, and because of their sheer length they are often compared to saber-tooth cats, despite the fact that gorgonopsids and cats aren't actually directly related beyond both being synapsids. In addition to the two, downward-facing saber teeth, Gorgonops also possessed shorter teeth for nipping in the front of its face and shorter, broader teeth just behind the sabers, probably for cutting. It is likely that Gorgonops delivered a killing bite to prey with the long teeth, puncturing vital areas, like the neck. Then it would use other teeth to actually strip the meat off the carcass. It is also very possible the long teeth had a role to play within the species, possibly for display. This possibility would hinge on whether or not the teeth of gorgonpsids were visible or covered in some kind of soft tissue in life. That is all for this week! As always, feel free to comment below or on the facebook page! Gebauer, E.V.I. (2007). Phylogeny and evolution of the Gorgonopsia with a special reference to the skull and skeleton of GPIT/RE/7113 ('Aelurognathus?' parringtoni) (PDF) (Ph.D. thesis). Tübingen: Eberhard-Karls Universität Tübingen. pp. 1–316.